For part 42 of my youtube countdown, we continue our prodigy theme as we take a look at Christopher Wallace, aka Biggie Smalls, aka the Notorious B.I.G.. 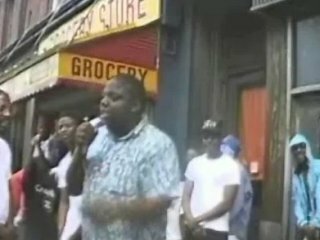 In this clip we see a 17 year old Biggie on the street in Bedstuy proving that he will be the best rapper in the world. There is something so magical and mind-blowing going on here. On the one hand, Biggie seems perfectly at ease in his environment, dominating this rap battle like no one in the world could with his perfect genius flow. On the other hand, Biggie is clearly a star. He is, pardon the pun, too big for this street. He is busting with talent and clearly going somewhere. This is the type of video you just repeat over and over and hate youtube for not having the entire battle posted to really soak the moment in. Anyway, Biggie is the greatest rapper who ever lived, and hope you enjoy this as much as I do.